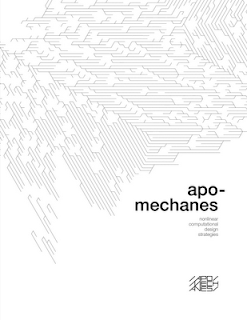 This book presents the projects designed and fabricated during the apomechanes computational design studio in 2009 and 2010, supported by theoretical articles and professional projects by Karl Chu, Carla Leitao, Kokkugia and Ahylo, exploring computational design and its fields of materialization. Apomechanes is an international intensive studio held each summer in Athens, Greece. The studio is devoted to furthering techniques and concepts of algorithmic processes as means for design and fabrication. Algorithmic design introduces processes that allow the genetic growth of complex structures and forms by using simple syntactic rules. Apomechanes is an attempt to set up a unique agenda on computational design methodologies and underline the morphogenetic qualitative characteristics of the algorithmic logic. Non-linear, self-organized and emergent behaviors are intravenously injected into the core of the architectural design process, and the focus is on the inherent potential of computation to generate space. All the projects were done using RhinoScript. You can find examples of the code in the book.